People often ask me, what is the most interesting thing to buy, when in Dubai? And I respond – every single time – with a little twinkle in my eye: Gold and diamonds! There are jewellery shops in every mall you visit, but I would only go there for inspiration. Their prices are just too high – most probably because of the steep rent they pay for the placement in a nice mall with many shoppers. Instead, you should head to Gold & Diamond Park, just off Sheikh Zayed Road, close to Mall of the Emirates. This is a shopping destination with around 90 shops dedicated entirely to jewellery. The selection and variety is breath-taking, and you will find jewellery of any imaginable style and design. Best of all is that you can stroll around and do as much window-shopping as you please, taking in the impressive array of rings, necklaces, bracelets, earrings etc. without being urged to come in or feel obliged to purchase. And that is important, when you are looking to buy a piece of jewellery. Gold & Diamond Park is indeed an authentic Dubai experience, which you must not miss, no matter whether you are on the look-out for a specific piece, or just browsing for a future jewellery dream that you want to pursue the next time, you are in Dubai. There is something special about gold and diamonds – no girl can deny that – and I guarantee that a jewellery purchase in Dubai will become one of those holiday memories that you will cherish and forever carry with you on your finger, around your wrist or neck. But what do you do, if you are not that knowledgeable about gold and diamonds and want to make sure that you are getting value for money? I am surely not a diamond specialist or a goldsmith, but after 100 visits to Gold & Diamond Park, I have a few tips up my sleeve to ensure that you get a positive experience and that it’s worth your money. Take your time. Kick off your vacation by visiting Gold & Diamond Park. It can easily take 2-4 days and 1-2 visits to finish off the purchase. This rule of thumb applies no matter if you buy a piece of jewellery straight off the shelf, if you want to recreate a piece from e.g. Pinterest, if you want to change or amend an existing piece or if you want your “old gold” to be melted and made into a new piece. Give the goldsmith plenty of time, so he can do his work to perfection for you. Check today’s price on the world market for 14 and 18 carat gold. If you are well-informed and know the current price of 1 gram of gold, you can bargain, once you know the weight of the jewellery piece that you are looking at. Remember that the salary of a goldsmith is significantly lower in Dubai than in our part of the World, so the price of the piece must be relatively lower than a Scandinavian jewellery shop. We are potentially looking at “half price”, but this should only be assumed as a slight rule of thumb. Bargain, bargain, bargain. Even if the shops inside Gold & Diamond Park are lovely and the whole place is as civilized as any other shopping mall in Dubai, there is no way you should pay the initial price quoted anywhere! Haggle ‘till you drop! You know that you’ve gone too far, when the shop assistant shakes his head and places the piece back into display. Then it’s time to either swallow your pride and pay the last quoted price – or get on with it, walk away and find another place to do your shopping. Breathe in. Even though it’s nearly impossible not to fall head over heels in love with your potential new piece of jewellery, you really should take a deep breathe There are a number of lovely cafes tucked away in and around Gold & Diamond Park. Head in and order some strong coffee, while you browse through the jewellery pictures on your mobile, until you’ve reached some sort of inner peace and are able to make a reasonable decision. Make an informed choice beforehand – especially when it comes to diamonds. If you are looking to get your hands on a diamond or two, you would do yourself a big favor by doing a bit of investigation before visiting Gold & Diamond Park. Are you looking to buy a so-called “investment”-diamond? Would you want to re-sell it in the future? Or are you “just” after a beautiful stone that you will wear for the rest of your life? There are massive price differences, when it comes to diamonds – and you would be wise to consider beforehand, whether you need a fully certified diamond with a formal GIA registration and assessment – or whether you are simply after a nice diamond that will be of emotional value for you and your family in the future. The very small diamonds – often referred to as accent diamonds – are even cheaper, and you can create beautiful rings or earrings with those for a relatively small amount of money. Go visit the workshop. Make sure that you get the once in a lifetime experience of going to the goldsmiths’ workshop right behind the Gold & Diamond Park itself. Ask to be taken there by a staff member, once you have made up your mind on a piece that you want in the shop. The workshops often stretch out over 3-4 levels with hundreds of goldsmiths hard at work – truly impressive places! If you end up buying an “investment”-diamond, the shop will not only invite you to view the setting of the stone, but actually insist that you do come along, as they want to make sure that both you and they agree that it is indeed the diamond that you purchased, which is now being set into the ring or necklace of your choice. You don’t have to fear being fooled or tricked inside Gold & Diamond Park. All shops are under strict surveillance and inspection by the authorities, as this place is one of the busiest and largest hubs for diamond trade in the World. The Scandinavian community in Dubai typically shops in either “Cara” or “Monili”, but you will get excellent service and quality in any of the shops inside Gold & Diamond Park. 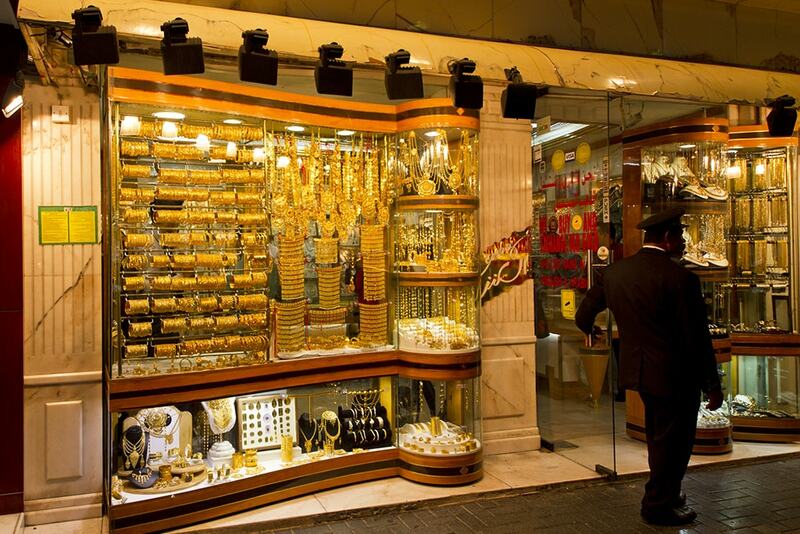 If you are really not a conventional shopper, I strongly recommend that you make the trip to the northern part of Dubai, where you will find the Old Gold Souk, which is surely something different. Here you will be pulled by the arm and invited into the shops for sweet karak-chai and a chat – and you will see the most amazing Indian and Middle Eastern bridal jewellery. Not exactly a calm shopping experience and not really a place for thorough consideration before you buy, but most definitely a lot of fun and really off the beaten track. PS: I am not affiliated with any jewellery shops in Gold & Diamond Park – I’m just a happy and satisfied customer.